Olivia Murray On Creating A Movement To Trust Your Art And Maintain Self-Care — EveryStylishGirl. In terms of having a balanced lifestyle, how do you balance your mental stability, college, and everything else? What do you do as a form of self-care? Self-care is so important. I’m really huge on Netflix, and I know that’s a very common answer but I like to watch foreign films on Netflix as well as foreign TV shows. I read this book called Still Here by Austin Channing who just so happens to be coming to my school today—she came yesterday and I’m going to try and get dinner with her today, but those type of things really keep me going. Above everything, I love hanging out with my family. I will take hanging out with my mom, brother, or dad, any time over watching Netflix. 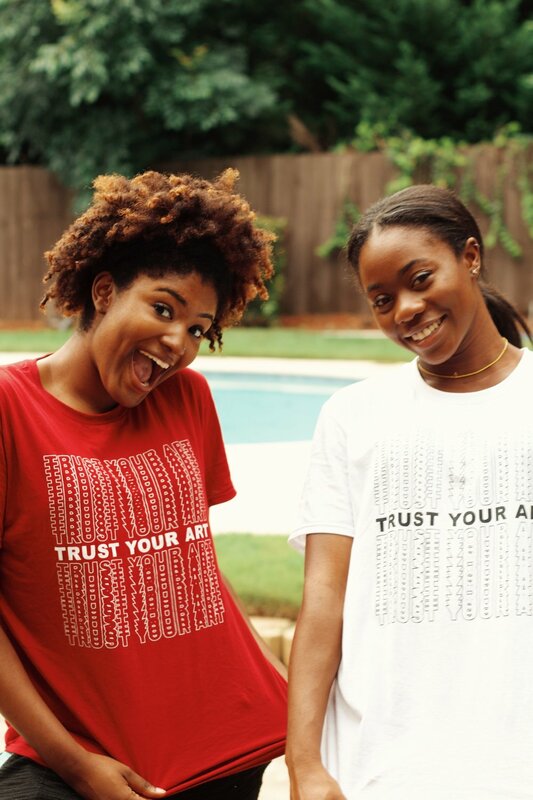 Your first shirt and sweatshirt creation is called Trust Your Art. Why do you think it’s so important for people of all ages and backgrounds to trust their art in whatever they do? I think it’s important because everyone has a story to tell. We are creators of what is known as history and if you don’t tell your own story then it’s going to be told by someone else, maybe not the way you’d like it to be told. For the importance of storytelling, I think it’s crucial that we come together as a collective and learn how to stop comparing ourselves and doubting our intuition on things we really care about or are passionate about. Everyone has their own story to tell and it’s up to you to be the creator of that story, and we want to hear it. What do you hope people will feel from wearing your apparel? I want it to be a confidence booster. As I was saying earlier, as creatives, you really have a tendency to be self-destructive in a mindful way. We’re constantly comparing ourselves, it doesn’t matter at what point or what level. I hope that people who buy my clothing understand that they’re good enough and they can go at their own pace. Slow progress doesn’t mean no progress, it just means that you’re moving at your own pace. Has there been a moment since starting the brand that you are most proud of? Firstly, when Salem Mitchell responded to my email and said that she’d wear a shirt, I freaked out. Salem Mitchell is the very first person to support me and then when Yara Shahidi’s people told me that she would wear the shirt, I was over the moon and I could barely hold in my excitement. That was huge for me. When she continues to wear it, my heart is filled with so much happiness. For someone who started this clothing line at 18 and balancing life in general, in what ways do you trust your own instincts when it comes to your art? I haven’t been able to create as much as I’d like to, but with the future projects I have in mind, I trust my art by hashing out an idea and executing my stuff on Adobe tools. For me, it’s been easier because when you have the confidence within yourself, you don’t tend to bash your creativity. Some days I do struggle with trusting my art which I think is a little ironic, but it goes to show that some days you’ll have it all together and some days you’re like dang. Having the reminder of shirts really help. I talk with friends and get other people’s opinions — people who I believe are creative and have a good eye to see what they think about it. Only you know when you’re putting in your best work. Where would you like to see your business go a few years from now? In a few years, internally, I would like to have a growing team of people that I can actually pay and employ. I wouldn’t be able to pay them much in my twenties but ideally, I would like to have a team of people I can employ. I would like to have a lot more creative shoots and brand videos that can really help put us on the map. For me, personally, I would like to give talks at different schools or create videos where I’m talking with people and helping them to trust themselves more. I love public speaking and connecting with people and I think that’s a huge part of my brand, creating a community of like-minded folks and inclusive folks. I would also like to keep it online. Who knows where the location would be, I’d see if I could have it in Atlanta because that’s where I’m from. Even in California, but I feel like that’s a ten-year plan than a few years. If there could be anyone in the world to wear your clothing, who would you want to wear it and why? There are so many people. You know who I’d really cry over if they wore my shirt, Kofi Siriboe. I think he’s so cute. Honestly, Michael B. Jordan because I want to get my men in there too and I want us to be inclusive. Zendaya, of course, came to mind because she’s a fashion mogul. I don’t know why Kofi first came to mind. Oh, wait, Issa Rae as well. In honor of Women’s History Month, who are the top three women you look up to? My mom right off the bat, the queen of my life. Another person I look up to is Issa Rae. I think she’s extremely funny and talented, and ambitious. She’s a fellow Capricorn so she’s super dope. I look up to my best friends—Seyi and Naaria, they’ve been my support team away from home. They’re both extremely smart and navigate life with such grace and eloquence so I love having them in my life. What advice would you like to tell others who are interested in creating their own clothing brand in the future? Have an idea, research the idea, then execute it—three steps just like Nike’s Just Do It. “Just Do It” is probably the best phrase on the universe because it doesn’t matter if you don’t have the resources because you can still create something. If you really need something, you can find a way to make it happen. Don’t let your financial situation, academic situation, family situation pull you back from doing something you really care about. With that being said, if you have an idea you want to make happen, find other people who can align with your idea and figure out ways to collaborate with them. Research, research, research and after you’re done researching, then execute it. Some fireball questions to help the readers learn more about you and your life! What are your astrology signs (sun, rising, moon)? A Capricorn sun sign with a Capricorn rising and Aquarius moon. Michelle Obama, but I’m not really sure how the conversation would go. I’d want to meet Yara so that I could say thank you so much. Who are your favorite artists and/or song you’re listening to at the moment? Song - Either Way by Phony Ppl and Almeda by Solange. Artists - Abstract Orchestra and Playboi Carti. Dream place to travel to? How would you describe your style right now in three words? Comfortable, fun, stylish.